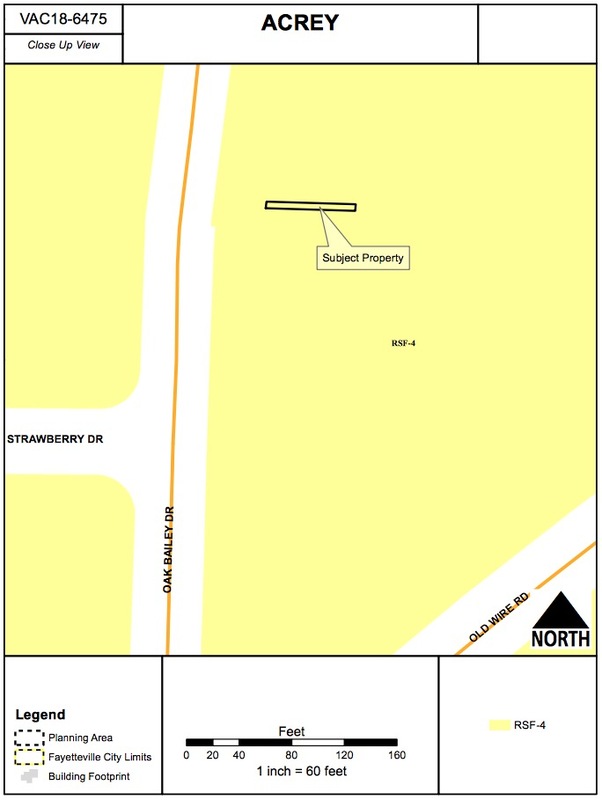 Rezoning 1.20 acres on North Starr Drive. 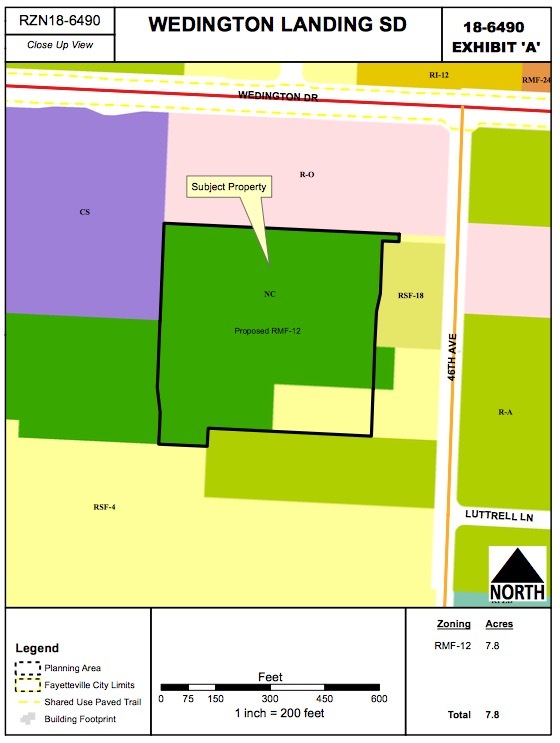 Rezoning 0.35 acres on Old Farmington Road. Rezoning 1.16 acres on North Shady Avenue. 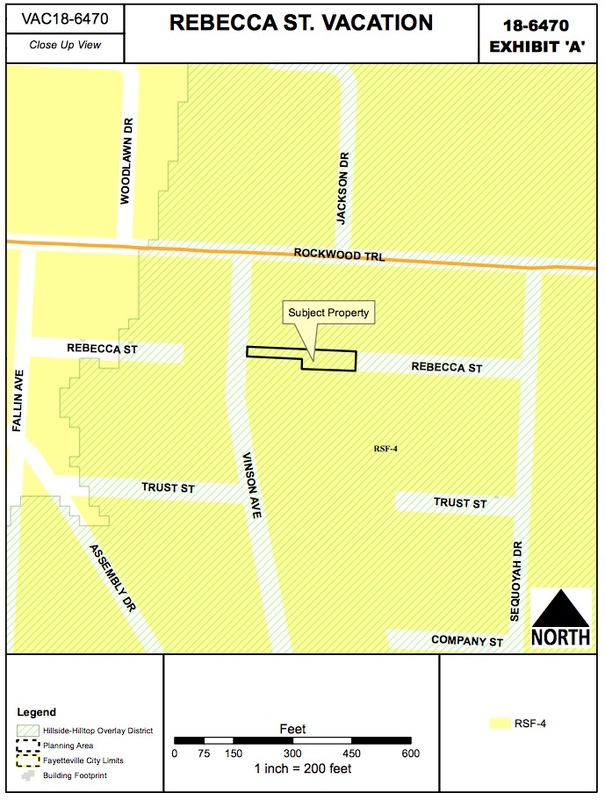 Rezoning 0.42 acres on West Sandra Street. 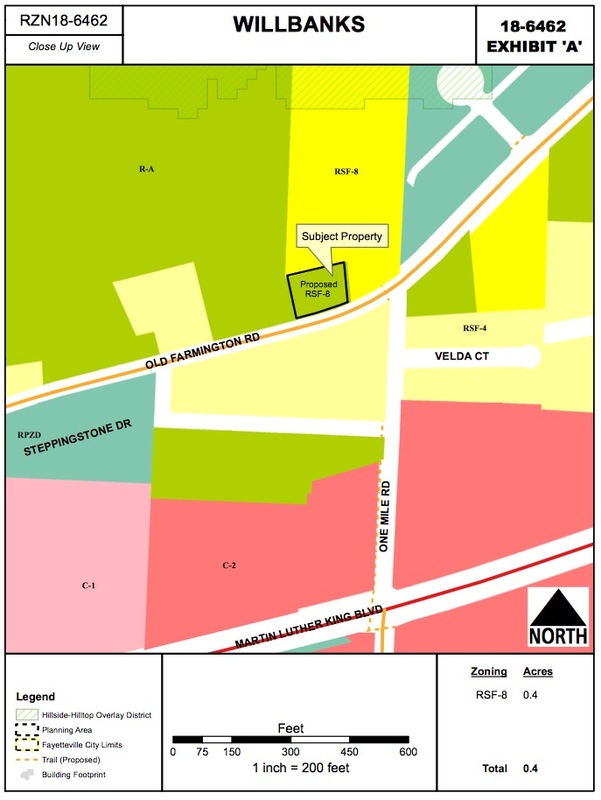 Rezoning 7.64 acres on West Wedington Drive. Changing the Telecommunications Board to the PEG Advisory Board. A certificate of public convenience and necessity for a new taxi company. A meeting of the Fayetteville City Council began at 5:30 p.m. Tuesday, Feb. 5, 2019 inside room 219 of City Hall, located at 113 W. Mountain St. in Fayetteville. 2. Hazmat Services Revenue (Details): A resolution to approve a budget adjustment recognizing hazmat services revenue received by the Fire Department from Washington County in the amount of $3,509.00 and increasing the related expense budget. 3. 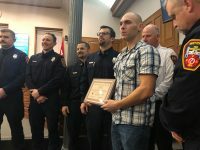 Fayetteville Fire Department Donation Revenue (Details): A resolution to approve a budget adjustment in the amount of $1,000.00 representing donation revenue to the Fayetteville Fire Department from the Bank of Fayetteville (Farmers and Merchants Bank) for the annual employee service awards event. 4. BKD, LLP (Details): A resolution to authorize Mayor Jordan to sign an engagement letter with BKD, LLP and pay an amount not to exceed $103,650.00 for auditing services for the 2018 Audit. 5. Bid #18-46 Geveko Markings, Inc. (Details): A resolution to award Bid #18-56 and authorize the purchase of preformed thermoplastic pavement markings from Geveko Markings, Inc. in variable amounts and for varying unit prices as needed through the end of 2019. 6. Repeal Resolution 08-19 (Details): A resolution to repeal Resolution No. 08-19 and authorize the purchase of a Dodge Durango with towing package from Superior Automotive of Siloam Springs in the amount of $26,922.00, pursuant to a state procurement contract, for use by the Community Resources Division. 7. Superior Dodge Ram – Chevy Traverse (Details): A resolution to approve the purchase of two Chevrolet Traverses from Superior Dodge Ram of Siloam Springs in the total amount of $50,602.00, pursuant to a state procurement contract, for use by the Engineering and Building Safety Divisions. 8. Superior Dodge Ram – Dodge Ram 1500 (Details): A resolution to approve the purchase of three Dodge Ram 1500 pickup trucks from Superior Dodge Ram of Siloam Springs in the total amount of $67,401.00, pursuant to a state procurement contract, for use by the Engineering Division. 9. EPA Region 6 Wetland Program Development Grant (Details): A resolution to authorize an application for a 75/25 Environmental Protection Agency Region 6 Wetland Program Development Grant in the total amount of $400,000.00 for stream restoration projects in the City of Fayetteville. 10. 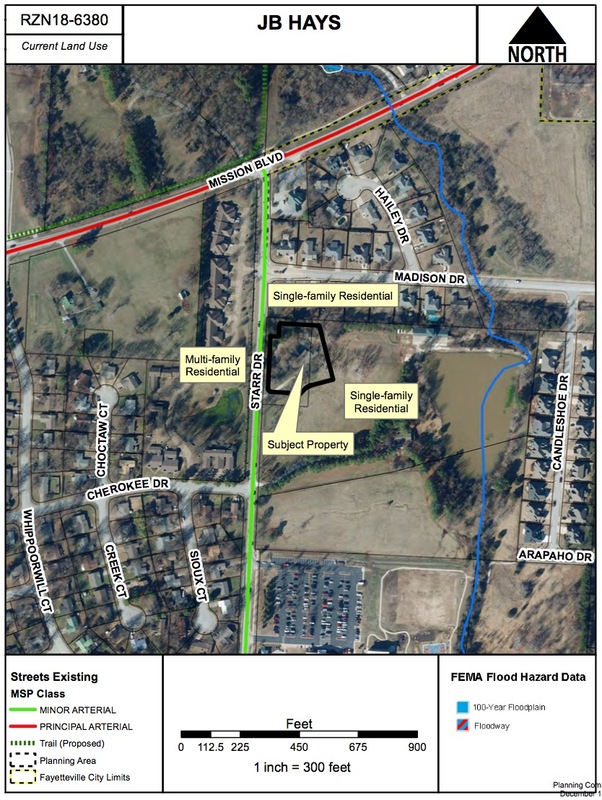 Northwest Arkansas Regional Planning Commission (Details): A resolution to approve a one-year contract with the Northwest Arkansas Regional Planning Commission in the amount of $41,812.00 for a stormwater education program for 2019. 11. Watershed Conservation Resource Center Task Order No. 1 (Details): A resolution to approve an amendment to Task Order No. 1 with the Watershed Conservation Resource Center in the additional amount of $16,702.35 for work performed during the assessment of streams through the city associated with a Wetland Program Development Grant. 12. Razorback Greenway Tunnel Improvements (Details): A resolution to express the willingness of the City of Fayetteville to utilize federal-aid Recreational Trails Program funds for Razorback Regional Greenway – Fulbright Expressway Tunnel Improvements, and to approve a budget adjustment. 13. Community Access Television dba Your Media (Details): A resolution to approve a budget adjustment in the amount of $10,000.00 recognizing public access television fee revenue to be used for promotional activities. 14. Kajacs Contractors, Inc. (Details): A resolution to award Bid #18-55 and authorize a contract with Kajacs Contractors, Inc. in the amount of $1,067,000.00 for construction services associated with the elimination of the Masters Sewer Lift Station, and to approve a project contingency in the amount of $106,700.00. 15. Hawkins-Weir Engineers, Inc. (Details): A resolution to approve Amendment No. 1 to the professional engineering services agreement with Hawkins-Weir Engineers, Inc. in an amount not to exceed $33,860.00 for construction management and observation services associated with the elimination of the Masters Sewer Lift Station. 16. Ranger’s Pantry/Senior Giving Tree Donations (Details): A resolution to approve a budget adjustment in the total amount of $600.00 representing donations to Ranger’s Pantry and the Senior Giving Tree. This item was left on the second reading at the Jan. 15 meeting. Council member Scroggin, who was on the Planning Commission and voted against the request, said he believes the president of the nearby neighborhood association doesn’t know that the denied rezoning request has been appealed to the council, otherwise he would be in attendance to comment. He said the commission’s decision was based upon the potential for further development of the land. Turk said she thinks the item should be held on the second reading to allow the public more time to weigh in. Marsh declined to retract her motion, but it failed 2-6 (only Marsh and Kinion voted in favor). The ordinance was left on the second reading. A representative from the nearby Crystal Cove subdivision board of directors spoke against the rezoning. He said the neighbors are concerned about the potential for development of the property as something other than the office that’s currently there. Council member Marsh asked how many people are on the board of directors of the subdivision. The representative said there are three board members, but there are 18 houses in the subdivision. Marsh said she’s not received any other feedback against the request. Kinion said after careful consideration, he decided the requested zoning is equally appropriate and compatible with the surrounding area. 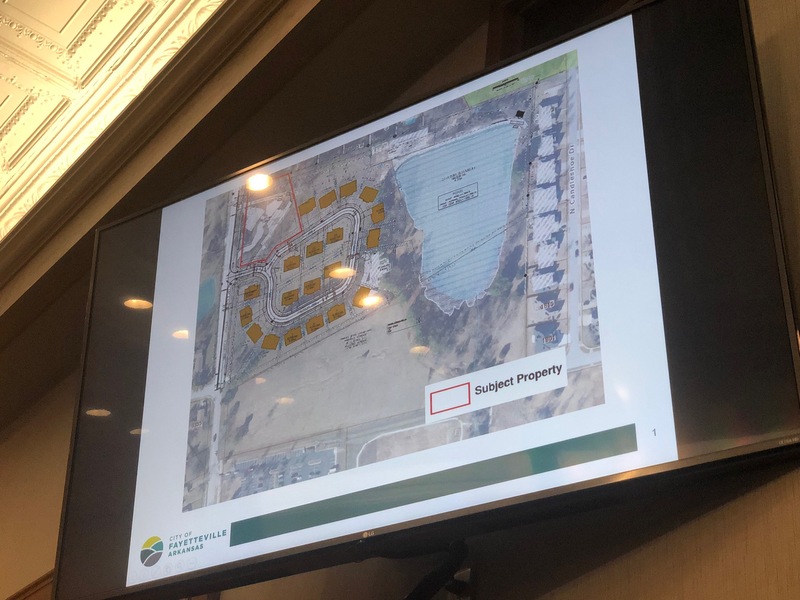 Bunch agreed with Kinion, and said anything that would be developed on the property would still need approval from the Planning Commission in the future. Scroggin said he’s usually for increased density, but said since this project is outside the Mayor’s Box, he won’t support the request. Turk said she agrees with Scroggin and she’s also against the request. Gutierrez made similar remarks. Marsh, Kinion, Bunch and Smith voted in favor. Gutierrez, Scroggin and Turk voted against. Mayor Jordan opted to cast the fifth vote in favor, so the ordinance passes. A resolution to grant a certificate of public convenience and necessity to Kyle Empsall d/b/a Payless Taxi for the operation of two (2) taxicabs in the City of Fayetteville. Four people spoke in favor of the certificate, and said the applicant is a good person who runs a good company. The owner of Fayetteville Taxi spoke against the certificate, and made several accusations about the applicant’s character and legal business status. He said the applicant has been operating his business in Fayetteville without a certificate. The owner of Dynasty Taxi also spoke against the certificate. He said he’s fine with competition, but he’s had to cut his fleet since the arrival of Uber and Lyft, and there simply isn’t a need for another taxi company in Fayetteville. Deputy Chief of Police Mike Reynolds said the applicant did indeed operate without a certificate, and that he was cited for that offense. Reynolds said the police department is trying to bring the applicant into compliance by helping him through the certificate process. Scroggin said he believes in a fair market, and he doesn’t want to restrict a business from operating in Fayetteville. Marsh said the applicant is clearly trying to get into compliance, and she thinks more competition is a good thing. The council voted 7-0 to approve the certificate. A resolution certifying to the tax collector of Washington County, Arkansas the costs of razing and removal of a dilapidated and unsafe structure upon the property owned by Tommie Jo Flowers-Davis and George E. Flowers located at 16 N. Willow Ave. in the City of Fayetteville, Arkansas. The owner is in favor of the raze and removal. The council voted 7-0 to approve the resolution. A resolution to award Fayetteville Public Library Bid Package #19-17 and approve Change Order No. 2 to the Construction Manager at Risk Contract with Crossland Construction Company, Inc. in the amount of $2,806,481.00 for early site work and utility relocations, and to approve a project contingency in the amount of $140,324.00. City staff said this change order will enable earthwork for the new library addition to begin now. An ordinance to waive the requirements of formal competitive bidding and authorize the purchase of spare parts and repair services for the thermal drying unit located at the Biosolids Management Site from AIT Services, Inc. in the amount of $117,917.67 plus applicable taxes, to approve a project contingency in the amount of $20,000.00, and to waive the requirements of formal competitive bidding for future purchases of parts and repair services for the thermal drying unit from AIT Services, Inc. through Dec. 31, 2021. Instead of sending biosolids to the landfill, the city in 2012 began a reuse drying process that converts the biosolids to a fertilizer, which is then sold for public use. Said said the process saves the city significant landfill costs annually, and through November 2018 generated about $48,500 in fertilizer sales. This item is to repair a thermal drying unit needed for this process. There was no public comment. Kinion said the city loses revenue every day that the drying unit is out of operation, so it’s important that the council pass this ordinance. The council voted 7-0 to approve the ordinance. An ordinance to amend the standard specifications for design and construction of water lines and sewer lines, 2017 edition as originally adopted in § 173.12 Standard Specifications for Water and Sewer Lines in Chapter 173 Building Regulations of the Unified Development Code and to move the amended regulations to Chapter 51 Water and Sewers. City employee Jim Beavers, whose engineering seal is affixed to documents and drawings, has retired. Staff said the approval of these changes will remove the requirement that his particular seal be attached to documents, and will allow another engineer’s seal to be included. Approving this ordinance, staff said, will ensure a smooth transition and avoid unnecessary delays to project reviews by the Department of Health. There was no public comment. Kinion and Marsh said Beavers will be missed. An ordinance to rezone that property described in rezoning petition RZN 18-6462 for approximately 0.35 acres located at 3030 Old Farmington Road from R-A, Residential Agricultural to RSF-8, Residential Single Family, 8 units per acre. Both city staff and the Planning Commission recommend approval this ordinance. The applicant stated they may want to modify or rebuild the house currently on the property. There was no public comment. Marsh said this location is a good place for increased density. Turk said she’d like to wait before moving the item through tonight, but she said so after the item was on the third and final reading. She declined to move to table the item, but said she thinks the rezoning process needs to slow down in general instead of moving through all three readings in one night. The council voted 5-2 to approve the ordinance. Gutierrez and Turk voted against, but neither said specifically why. An ordinance to rezone that property described in rezoning petition RZN 18-6464 for approximately 1.16 acres located at 2081 N. Shady Ave. from C-2, Thoroughfare Commercial to NS-G, Neighborhood Services-General. Both city staff and the Planning Commission recommend approval this ordinance. The property has been used for years as a gravel parking lot and small office for Don’s Moving, Inc. The applicant intends to build single-family homes on the property. There was no public comment. Turk reiterated her comments from the item above and said she’d like to wait before moving forward. Scroggin said signs have been posted on the property for at least six weeks, and with no members of the public here to speak against the request, it doesn’t seem inappropriate to move forward. Bunch agreed with Scroggin, and said the neighboring residents also received letters in the mail notifying them of the requested rezoning. Marsh also agreed, and said the issue isn’t complicated and she’s in favor. Kinion said he hasn’t heard of any opposition, and with the request being to move to a form-based code, he’s in favor. Smith said he appreciates that the Planning Commission suggested a form-based code, and he’s in support. Gutierrez said she’ll go with the city staff and Planning Commission’s recommendation by voting in favor. City Attorney Kit Williams asked anyone who votes against a rezoning to please state their reasoning in the case that the item fails and the property owner sues the city. Williams said if that happens, he’ll need to defend the council’s decision in court, and he’ll need to know why the council made its decision. 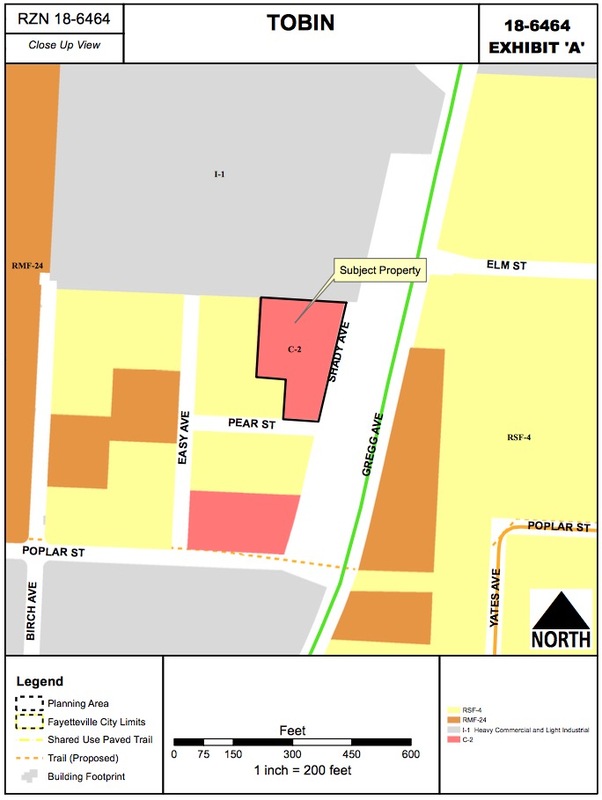 An ordinance to rezone that property described in rezoning petition RZN 18-6472 for approximately 0.42 acres located at 3033 and 3035 W. Sandra Street from R-A, Residential Agricultural to RSF-8, Residential Single Family, 8 units per acre. Both city staff and the Planning Commission recommend approval this ordinance. The applicant stated they may want to redevelop the property. There was no public comment. Turk said she’d like to wait before moving forward. A motion to move to the third and final reading failed 4-3 (Gutierrez, Turk and Smith voted against). The item was left on the second reading. The discussion will continue Feb. 19. An ordinance to rezone that property described in rezoning petition RZN 18-6490 for approximately 7.64 acres located at 4847 W. Wedington Drive from RSF-4, Residential Single Family, 4 units per acre and NC, Neighborhood Conservation to RMF-12, Residential Multi-Family, 12 units per acre. Both city staff and the Planning Commission recommend approval this ordinance. 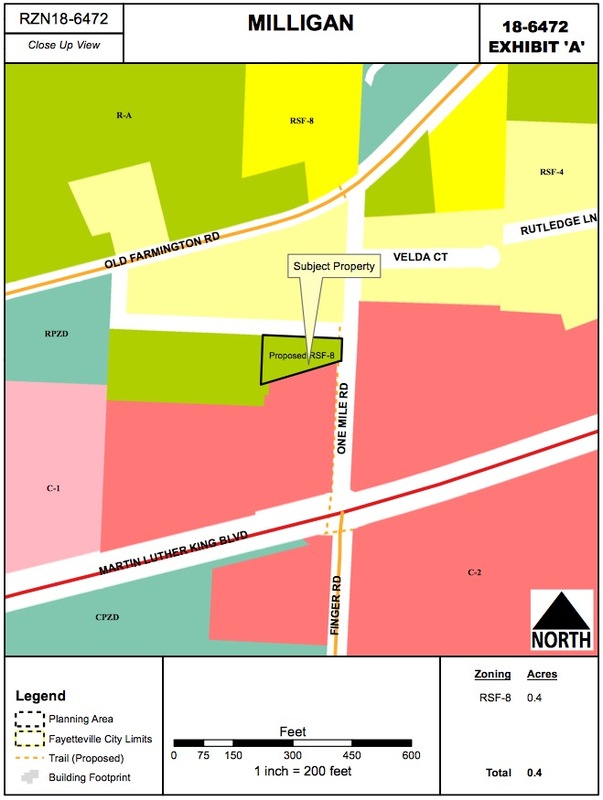 The applicant has stated that the rezoning is needed to facilitate development of the property. There was no public comment. Smith said he’d like to leave the item on the first reading to allow more time for the public to weigh in. Turk agreed. The item was left on the first reading. The discussion will continue Feb. 19. An ordinance to approve VAC 18-6470 to vacate a portion of unbuilt Rebecca Street right-of-way between Vinson Avenue and Sequoyah Drive. The following easements be retained: o 2018-00035003; 2018-00035002; 2018-00034944. There was no public comment. Marsh suggested leaving the item on the first reading to give the Active Transportation Advisory Committee a chance to discuss whether it would be feasible to use the property in the future for a possible sidewalk or “urban staircase” to help pedestrians get farther up the mountain. City Attorney Kit Williams said the land is not city property, but rather private property in a city right-of-way. For that reason, Williams said it’s not likely that the city could build anything on the property. An ordinance to approve VAC 18-6475 for property located at 3024 N. Oak Bailey Road to vacate a portion of a utility easement. An ordinance to waive the requirements of formal competitive bidding and authorize a joint funding agreement with the U.S. Geological Survey for stream gauge operation and maintenance and water quality sampling and monitoring at various locations in the City of Fayetteville in 2019 with the amount paid by the city not to exceed $61,721.00. In 2015 the city began monitoring both flow and major pollutants Town Branch and Mud Creek. The data is used to model pollutant concentrations in each stream. The information produced by the gauges can be viewed on the USGS website (see Town Branch data and Mud Creek data). This ordinance would provide funding for continued stream gauge operation. 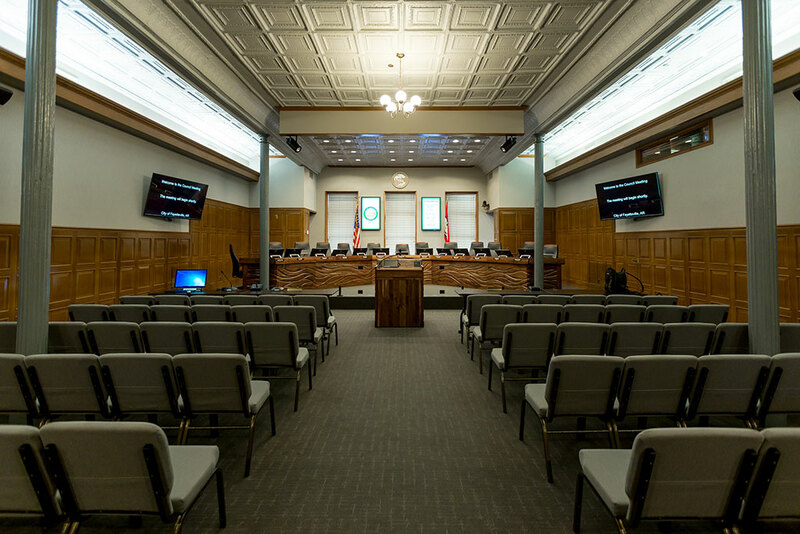 A resolution to amend the 2019 adopted budget by re-appropriating $100,186,000.00 in bonded or ongoing capital projects, outstanding obligations and grant funded items. Budget appropriations for 2018 expired Dec. 31. Equipment and supplies or services must have been received by then in order to be charged to the 2018 budget, but that did not happens for some departments. In these cases, unspent amounts for those projects and items need to be re-appropriated since they were not included in the 2019 budget. This resolution would re-appropriate those funds. An ordinance to amend Article IX Telecommunications Board in Chapter 33 Departments, Boards, Commissions, and Authorities of the city code to change the name to PEG Advisory Board, reduce the number of members, and refocus the purpose and intent of the board to advising the City Council on issues related to the city’s Public Access, Educational, and Government (PEG) channels. Staff said because the State of Arkansas passed state oversight of cable franchising, oversight was taken away from the hands of local municipalities, which removed some of the primary duties of the Telecommunications Board, including its role in the realm of telecommunications rights-of-way. The changes in this ordinance, staff said, will better serve the board’s purpose of advising the City Council on issues related to local access channel usage. A resolution recognizing the opioid epidemic in the United States of America and in Arkansas; and to engage in litigation against those entities and people responsible for this societal crisis. This item was first brought forth in December 2018 but required the city to engage in litigation as a member of the Municipal League Defense Program. However, with program fees expected to cost $91,000 annually, City Attorney Kit Williams offered to look into ways that the city could join in litigation without incurring any fees. At the time, Williams said it’s unlikely the city would recoup much money in a lawsuit since Fayetteville doesn’t own a hospital and couldn’t provide much proof of any damages other than time spent by police officers responding to an overdose. He said most current overdoses are from fentanyl, not prescription opioids, so the chances of recovering the annual fees are very slim. The council agreed to table the item in December. With this new resolution, the city will not be responsible for any attorney’s fees or expenses. The law firm will operate on a contingency basis, and will receive thirty-three and one-third percent of the gross recovery of a successful lawsuit. There was no public comment. Scroggin said he’s glad to see the city doing something about the opioid crisis. – Fayetteville will be the site of the world’s biggest cyclocross event in 2022. – The dates for the four spring bulky waste cleanup events were announced last week in Fayetteville. This meeting was adjourned at 8:04 p.m.